Decorators’ chocolate or confectioners’ chocolate isn't actually chocolate at all; it is more like a chocolate flavoured liquid sweet. Decorators’ chocolate or confectioners’ chocolate is mainly used commercially for things such as covering strawberries or decorating cakes. It is designed to melt easily and harden quickly so is ideal if you are using large quantities in a short amount of time. It is also an easy start for beginners who are learning how to decorate cakes with chocolate. Unfortunately, decorators’ chocolate lacks the flavour of real chocolate. If you have the time and patience (and the know-how), you should use real chocolate for a more superior finish and flavour. Decorators’ chocolate is one of the easiest ingredients to use to perfect your cake design; it melts and sets solid quickly in almost any shape or form you want. Using Decorators chocolate is a great way to get into cake decorating and learn how to execute professional-style chocolate finishes with greater ease than real chocolate. Decorators’ chocolate can be used in icing – for piping frosting and decorating your cake. Alternatively you can try a frosting recipe that includes a chocolate glaze. You can also use decorators’ chocolate to chocolate curls. 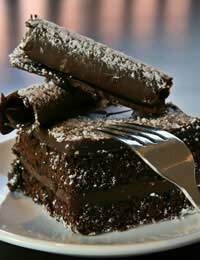 Chocolate curls will liven up a cake, look professional and are quick and easy to perfect. Chocolate curls will add panache to a number of dishes, including chocolate mousse, puddings, after dinner desserts and ice cream. Simply ice or frost your cake with your chosen icing recipe. Then use a potato peeler to shave off small chocolate curls from the edge of a warm (around room temperature) chocolate bar or block. You can also make broader curls by scraping the peeler along the broader, flat surface of the chocolate bar. Larger chocolate curls can be achieved by using a decorators’ wallpaper stripping tool. Simply melt the chocolate and spread it in a thin layer on a clean, smooth work surface or baking sheet. When it is just set, use the decorators’ tool to strip the curls off (if the chocolate snaps it has set too hard and you will need to re-melt and set it). Smaller chocolate curls are made in the same way, and are called caraque. You can experiment with this method, by using different chocolate colours (such as dark and white) to create a marble effect. Decorators’ chocolate is also great when making chocolate leaves. Simply find any number of clean, fresh leaves that are free from chemical sprays (any shape or size will do). The best leaves to use are those that are pliable and strong. Melt the chocolate and use a small paintbrush to paint it over the underside of the leaves until they are completely covered. Leave the chocolate to cool and set, then gently peel the leaf carefully away from the chocolate. This is a popular design for cake decorating, and works easily for any chocolate cake recipe. First ice your cake, using your chosen icing. With a different colour chocolate, pipe lines or a spiral over the icing, using a piper. Then, with a skewer, draw lines across the cake, first one direction, then the other to create the feathered effect. Cake decorating is a fantastic way to use your creativity and take your love of chocolate to the next level. Using decorators’ or confectioners’ chocolate is a great way of starting out in cake decorating, as it melts and sets much quicker than regular chocolate, so is easier to use.